A walk along the Champs-Élysées ,I can see where places like Rodeo Drive got there inspiration from. All the well known shopping brands are here along the Champs-Élysées, and then at the and you come to the Arc de Triomphe. Huge crowds again and cars and buses everywhere. The Arc de Triomphe de l’Étoile is one of the most famous monuments in Paris. It stands in the centre of the Place Charles de Gaulle (originally named Place de l’Étoile), at the western end of the Champs-Élysées. 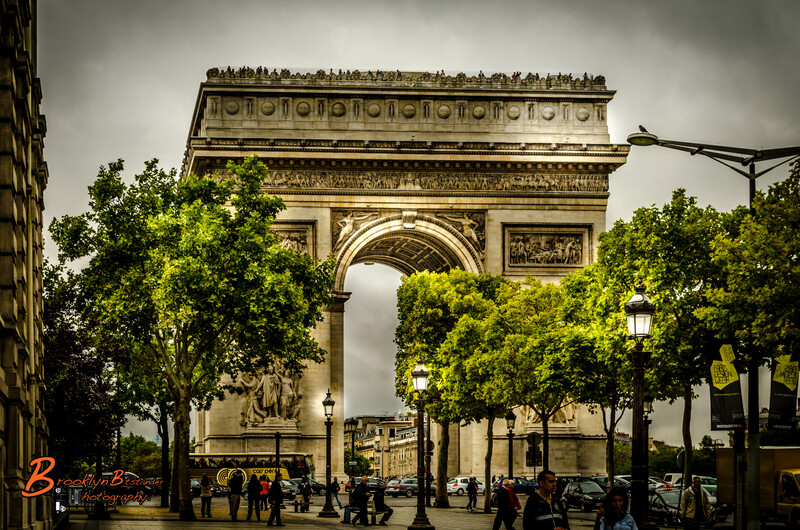 It should not be confused with a smaller arch, the Arc de Triomphe du Carrousel, which stands west of the Louvre. The Arc de Triomphe (in English: “Triumphal Arch“) honours those who fought and died for France in theFrench Revolutionary and the Napoleonic Wars, with the names of all French victories and generals inscribed on its inner and outer surfaces. Beneath its vault lies the Tomb of the Unknown Soldier from World War I. This entry was posted in Photography and tagged Arc de Triomphe, architecture, colour, digital, France, Holiday, Lightroom, Paris, Photography. Bookmark the permalink. I love your Paris photographs! Enjoy your stay! enjoy your stay!!! If you have time, in rue Mouffetard (5 arrondissement), i love the small market, the spicesshops, cheese, wine, vegetables, small restaurants..
:)))))))))) enjoy!!! i wish i could be there too! Thank you I hope you get to see it if you haven’t already !! beautiful blend of trees and environment..each got a scale. The sky is perfect for this picture. It sets off the rest so nicely. I love this shot! We were there earlier this year, with not a leaf on the trees. These are lovely to see and Paris is just so…good!! Have fun. I made my wife stand in the middle of the Champs with the Arc behind her to photograph it. Traffic zoomed by from both directions and a taxi driver tried to sneak in a pinch. Nice shot. Now I Have and excuse to go back !